The Coyote Walk Itinerancy is an annually changing proposition about the connectivity between “nature” and the city. The project was inspired by an errant coyote that appeared in Central Park, New York City about 10 years ago, causing confusion and media sensation upon arrival. 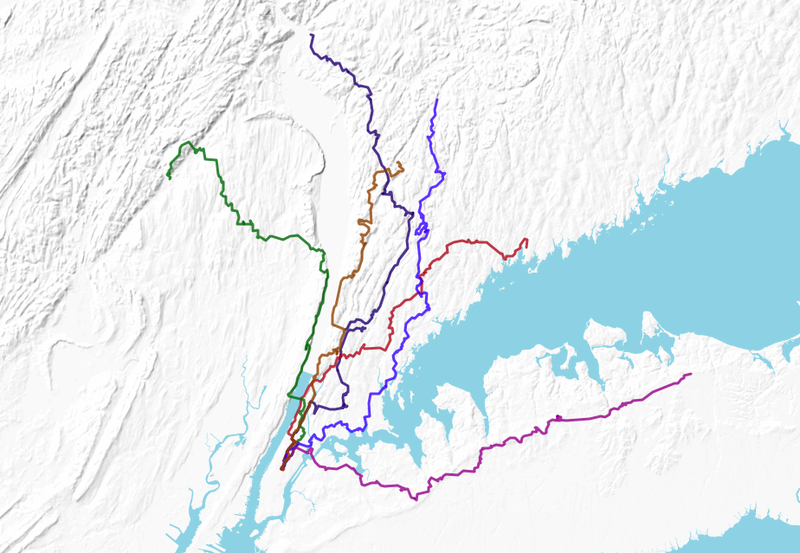 Since 2009 the continuous three-day trek, which leaves each year in early spring from the location the coyote was first spotted, has illustrated a variety of animal-like paths out of the city. Animal-like in this scenario is interpreted as a gravitation towards green space, avoidance of people and high-density development where possible, and occasionally disregard for public/private space designators. However, the walk is a distinctly human project, taking advantage of existing trails and food along the way. It serves as a ritual commemoration to the spirit of the coyote, who– after making a presumably harrowing journey into the heart of civilization– died moments after being re-released into the wild (autopsy showed consumption of a poisoned rat). Over seven years the Coyote Walk has developed from a solo project to its present “itinerancy” form in which fellow walkers and collaborators are welcomed along to shape the path, experience a slow transition from city to nature, and participate in an ambling discourse. The project touches on a sprawling body of loosely organized research encompassing biological description of the coyote– a colonizing species, art historical reference, and readings of trickster mythology. A Coyote Walk could be undertaken from any dense city that has a discernible center. The goal is simply to reach a “wild” location on foot using the logic noted above.